A big hello to you all from me who has been MIA for few months now. The break (which started with our vacation) got extended to fulfill some personal responsibilities, and all this meant regularly posting on the blog would take a back seat. Having moved into our new house few months back , getting organized was the priority. Once that was done I got my time assigned to do some creativity for blank walls and transform our house into cosy home. I love simple DIY decor projects. 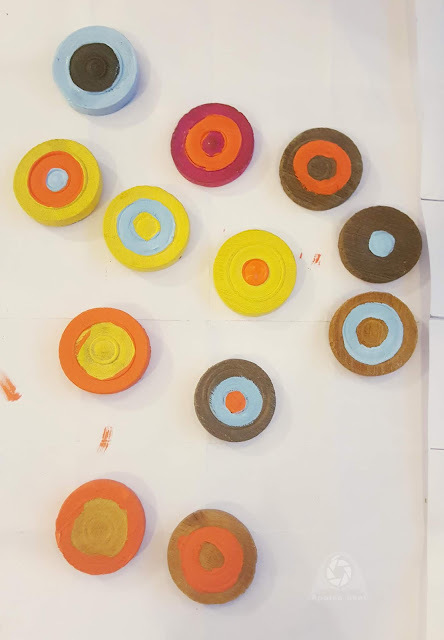 They are fun, they are affordable and lastly it gives us the freedom to add our own creativity. Finished few of the DIY projects until now and I am happy with new look of our living room.. chic and creative! Immediately decided to share it on blog and grab this opportunity to get back on track. Hope you get inspired to add a beautiful touch of your own to the blank walls with this cool DIY project. 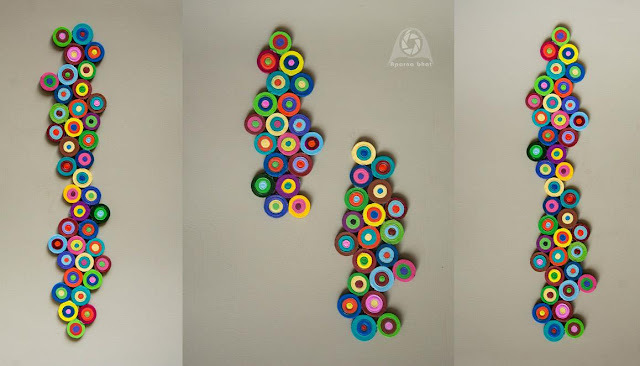 Below is a simple DIY wall hanging project using carrom coins. 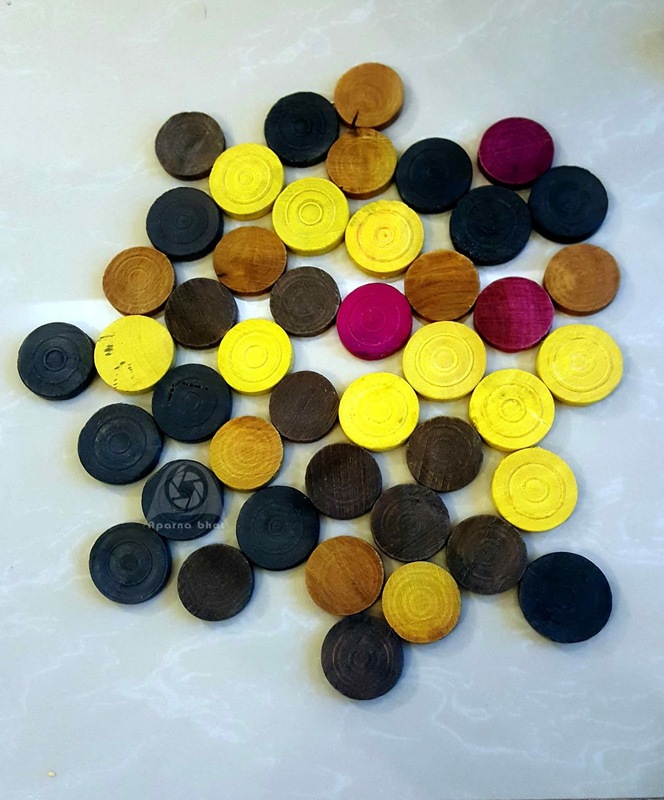 You may use bottle caps or corks instead of carrom coins and go ahead with this art. 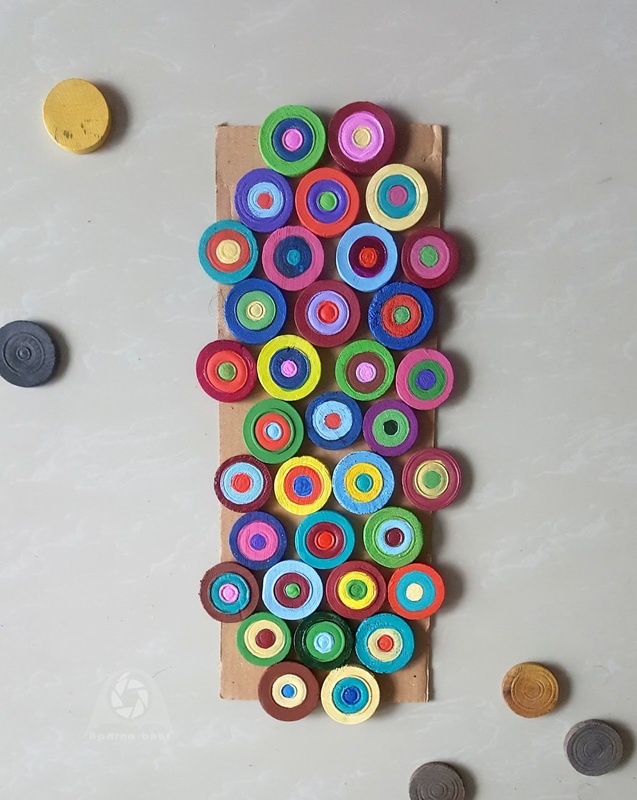 We had some carrom coins lying in excess so instead of disposing them the decision was taken to make a beautiful hanging wall decor using them. The idea was to create something like modular log wall panel. But then I wanted some splash of colors to brighten up the walls in my living room and hence decided to paint these coins. For those interested you may watch the video tutorial posted below to know the things you would need and how to go ahead with this project. Any queries/ doubts you may leave a comment below. Apply a coat of acrylic varnish. Once it dries apply another coat. This will seal the colors on the coins and protect it from dust.